Notes on nature Will your local jays and squirrels go hungry this autumn? Will your local jays and squirrels go hungry this autumn? It turns out that this is the work of a small wasp which goes by the snappy name of Andricus quercuscalicis. The weird growths themselves are known as 'knopper galls' - the word knopper being derived from a word for a knob, stud, tassel or hat. The 'gall' is the growing acorn's response to the wasp grubs developing inside after eggs were laid there earlier in the year. In a similar way, you might have seen the robin's pincushion gall before - it's a common sight on wild rose bushes, with a tangled mass growing from the stem eventually turning red. At The Lodge, at least, there are not many acorns to be found this autumn. The galls are turning brown and falling off the trees, and the newly-hatched wasps making their escape. 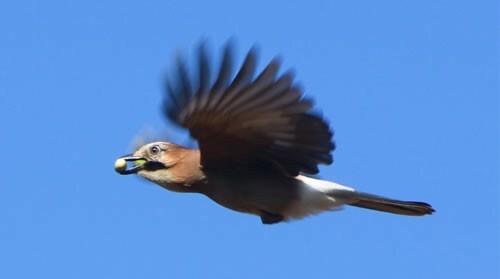 Jays are famous for their love of acorns, able to store away as many as 5,000 for a rainy (or cold) day. What will they do here this year? As members of the crow family - clever, bold, adaptable and omnivorous - I doubt jays will go hungry. They just might need to look for some different foods in different places, so I wonder if that could mean an influx of jays to garden bird tables? In the same way, might we see squirrels launching a hunger-fuelled assault on our feeders? 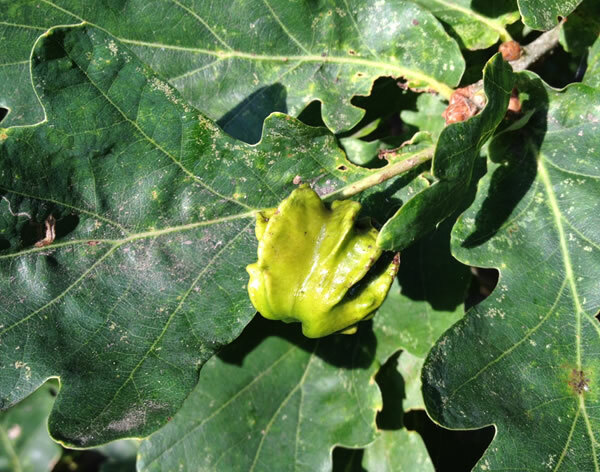 Have you spotted knopper galls on your local oak trees? Leave a comment and let me know. Squirrels get a ridiculously bad reputation, most of it undeserved. Some people seem to blame them for the fall of The British Empire. They've been here at least 40 generations now in areas, pushing the term invasive species. Red squirrels are though to have been introduced from Europe just a few hundred years ago. Reds verses Greys was evolution in action and entirely human's fault. And yet some people still want to go out and kill them as if they burglars. They are not burgling your home they just want some of those juicy nuts and other food you temptingly put out on your feeders every day. Give them a break, and a separate feeder with shelled peanuts, while there are shelled peanuts in their feeder, they'll ignore everything there is. After reading all of this I think I must have the most well behaved Squirrel visitor in the whole of the south of England. He is old now but I collect acorns for him and he is quite content taking them and leaving everything else for the birds. He does make quite a few holes in my front lawn when he hides the acorns but I am not bothered about that as my garden is more about wildlife survival than pretty, pretty for me., and it is more moss than grass so his digging actually benefits the lawn as long as I remember to remove the little oak seedlings the next season. I do not agree with a mass eradication as nature has shown in the past how eradicating one species or at least taking it to near extinction can cause a major imbalance within other species both Flora and Fauna. As much as you don't like them or view them as a pest they in their own way are part of the natural balance. We have Bees struggling to survive, an overload of magpies because their natural predator has been hunted to near extinction in some areas, they in turn kill baby pigeons, and take the young from other nests including house and tree sparrows that are also struggling to survive. The best way is to allow nature to address the balance. I should have read Katie's note and the Wiki article. Turkey oak seems to be a double edged sword. Is it's support of the wasp's reproduction in spring more damaging than the benefit of acorns in the autumn? At Wimpole Hall, Cambs., all acorns on English Oak seem to be affected by the gall wasp, but one large specimen of Turkey Oak, standing between 3 affected Engish oaks, was completely clear of galls and had a good crop of normal acorns. I do not know if this species is equally attractive to Jays but there were quite a few of them around. I know that some oak-feeding Lepidoptera find the leaves of turkey oak either too tough or distasteful, so perhaps the wasp is also repelled. The big question is therefore,"are the acorns palatable?" Hi Katie re my first post yep i've just this minute had my first Jay in the garden.